) and it should work fine! 2) if you use a wacom tablet and you do not drag, you may notice that you go out of your tablet's range much easier than on windows. this is because of a tablet feature where it has two different states of being in proximity, and in range, in which the pen is still close enough that the tablet detects it but not as close as "in proximity". the current linux wacom drivers completely ignore this second state, and only update your pen's location if it's in proximity. but the maintainer of the linuxwacom project has done some work on it (i'm not sure if they're planning to merge it (perhaps as a setting) to the main driver), and this branch is the fixed driver where you can lift your pen as high as you could on windows. 3) approach circles look weird? limit your fps. Thanks for having written this - and keeping up to date. That said, it doesn't seem to work on my side - under Debian stable (stretch). I've tried so many tutorials but I'm really stuck. 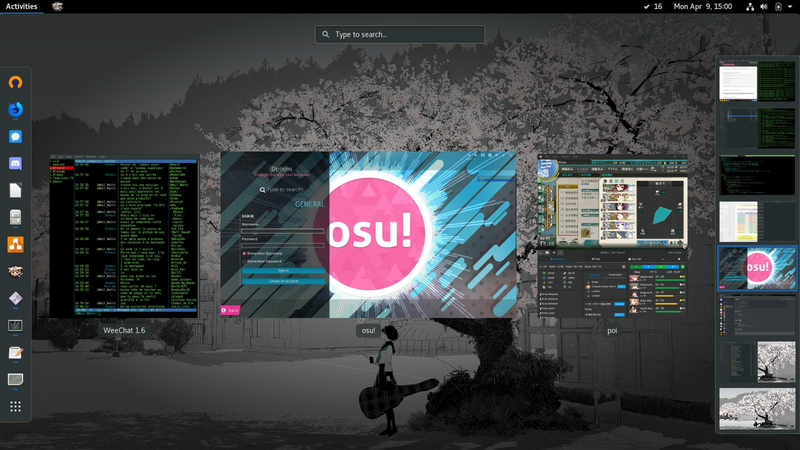 Since I wiped my Windows partition in December, I didn't find a way to play osu! again and it's quite troublesome to me. As usual, wine is going nuts and I don't have a clue of what's happening. I know your tutorial isn't especially designed for Debian systems, but if you have any idea of where I can start digging to have a chance to make it run, please let me know. Last edited by Neil Watts April 9, 2018 at 11:45:34 AM GMT , edited 1 times in total. Last edited by Franc[e]sco April 9, 2018 at 12:30:17 PM GMT , edited 1 times in total. Oh my god, seriously, thank you. I was thinking the installation failed because of all the errors wine was throwing in the console, without even trying to understand why there was a command attempting to open osu!install.exe with regedit. Can't thank you enough, I'll be able to click circles again now. Feel free to contact me if you need to debug anything under Debian. hello there. i have got arch linux. i was about to throw this away because no internet connection on wine. but now i figured how to fix that. write "sudo pacman -S lib32-gnutls" and i guess your issue will be fixed. https://osu.ppy.sh/ss/10759611 do you think i can do anything with this? i have got better performance on win. Last edited by XHPLAYER[_] September 30, 2018 at 3:40:46 PM GMT , edited 1 times in total. Last edited by XHPLAYER[_] September 30, 2018 at 3:40:37 PM GMT , edited 1 times in total. they turned out like this . . " https://github.com/Francesco149/loli-ov ... sound.conf "
Last edited by Franc[e]sco April 22, 2018 at 12:26:00 PM GMT , edited 3 times in total. Last edited by XHPLAYER[_] September 30, 2018 at 3:39:56 PM GMT , edited 1 times in total. idk how to change winealsa.drv on newer versions of wine, i'm guessing that's the problem ? ? Last edited by XHPLAYER[_] September 29, 2018 at 2:10:59 PM GMT , edited 2 times in total. Last edited by XHPLAYER[_] September 30, 2018 at 3:40:09 PM GMT , edited 1 times in total. Just came back from eternal slumber. Wine 3.0.1 seems to have neat and good compatibility though. Ubuntu 18.04 with Artful build of Wine. Running it with generic kernel gives me usual latency and lag, while with low-latency kernel gives me better gameplay but... crappy sound (especially when it comes to hit sounds). I have question about the dsound regedit setup, I'm lost on how it suppose to be set up exactly in wine regedit. I've done everything else and it all works except for the audio latency issue. I'm using Manjaro kernal 4.14.